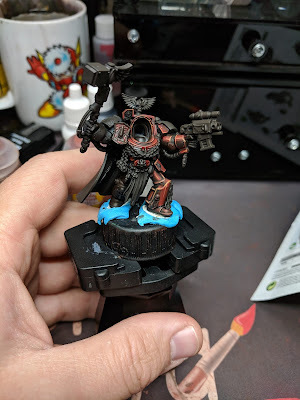 On Monday, I got started on the Terminator Captain for the Blood Angels commission. To help save time, I picked up a can of Rhinox Hide spray for the primer and base coat. 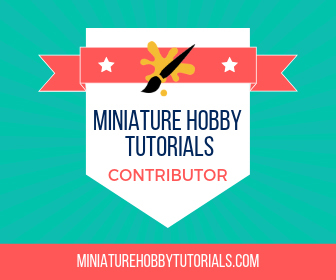 This saved me a step in painting and a boat load of time. From the primer coat, I mixed Rhinox Hide with Mephiston Red and built it up from there to Mephiston Red. This was then edge highlighted with Wild Rider Red and then another edge highlight of Fire Dragon Bright. This was a slight change to how I tend to do red. Usually I will go from Rhinox to a mix of Rhinox and Khorne Red, but on this one I jumped right from Rhinox to Mephiston mixed with Rhinox. I think it worked really well and the jump in brightness helped the effect. So far, I'm about 2 hours in, according to the timer on OBS. I'll be continuing the paint job later tonight and hopefully finishing the red. He'll be on YouTube in a month or so, after Takata has aired. This piece has been in a holding pattern since 2016. I'd had some issues with how I wanted to do the ground and the waterfall feature. But I broke through some roadblocks this week when I found some nice cobblestone mat at Michael's in their Christmas decorations... yes, Christmas stuff is out on shelves already and its a bit ridiculous. I measured and trimmed the mat as if I was laying carpet and it worked really well. The first section I put down has a little seam in it, but the opposite side I was able to do in one piece. The effect looks nice and hopefully it takes paint well. I've not done any tests of it's paintability. But, it's just a terrain piece anyway. For now, I'm not going to do the river tiles. 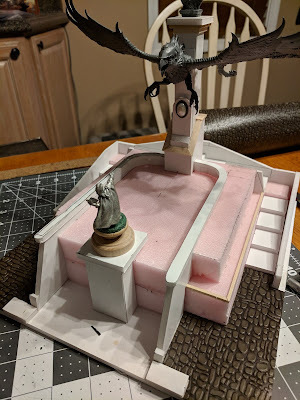 I am going to do a rounded pool section tho to help finish it off for the time being. Eventually I'll do the rest of it though. 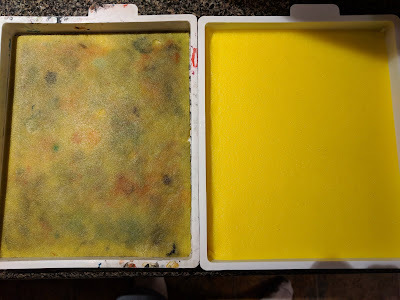 After 2 years of use, it was time to retired the sponge in the wet palette. I went on the lookout for one, but all I could find locally was new paper or new palettes. After a couple minutes of debating, I decided to just buy a new one and lucky for me I was able to get it for 50% off because of a coupon. So it was a win/win for me. It was interesting comparing old to new. 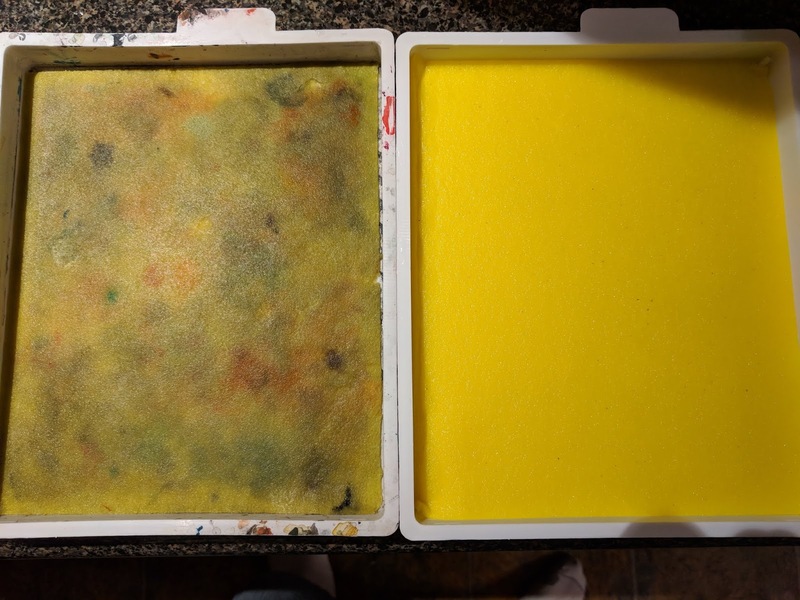 The old sponge was matted down and covered in paint stains, the new one was all nice and bright and super fluffy feeling. I broke it in on the Terminator Captain too. Its so nice. That's it for now. 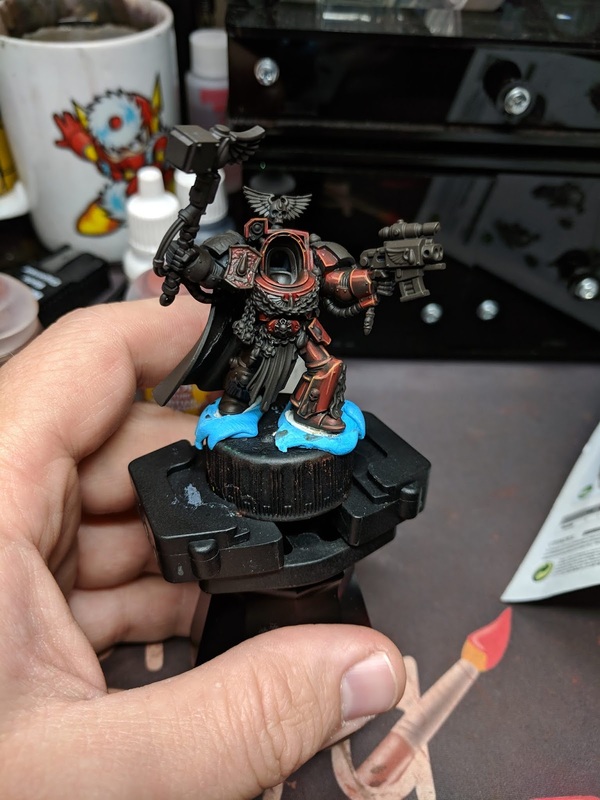 Tonight I hope to get more work done on the Blood Angels commission, but I am also heading to the game shop for some 40k gaming. The mojo is flowing again and it's full steam again now. Great work! Looking forward to seeing how the Terminator Captain turns out. Thanks buddy! I'm digging him a lot. Can't wait to see him finished and see how he comes together.